Round one is upon us and we need to get our teams organised before full lockout happens. I am back again to help you get sorted for the 2018 season! It may be a Thursday, but let’s SCRAMBLE!!!!!! Welcome back everyone! Round 1 is upon us once again, where did that off-season go? I hope you have all been doing your research and you have your team all set up! Oh who am I kidding, I am sure that, just like me, we are all waiting for teams to be released to see which rookies are going to be named so that we can slot them into our lineups. So, for the first time this season, let’s Scramble!! Whilst you are getting things set up for your team and picking your rookies for the year, just beware of what we like to call the Relton Roberts Rule. This rule tells us not to just select someone that we see named tonight as a knee jerk reaction. A few years back we all did this with an unknown rookie called Relton Roberts who debuted for the Tigers on the Thursday night. We all jumped on and then about a week or so later we never heard from him again. We like to make sure that we are only selecting players that we have heard about in the pre-season. With all the research and articles out there now it will be very unlikely there is a star rookie that we don’t already know about. You can really get burnt by picking an unknown rookie. So just be very careful! Tonight is the first of this season’s Partial Lockout situations in AFL Fantasy. What this means is that as of the first bounce tonight, ALL Carlton and Richmond players will be locked out. You will not be able to select, drop or move any of these players. Then, until the first bounce on Friday night between Essendon and Adelaide, you can make as many changes as you want to the players from the remaining 16 teams. Once that Friday night game starts, you are locked into your starting squad. Sportsdeck (Or Real Dreamteam as most of us know it) will have a Full Rolling Lockout all weekend for this weekend only. Then it will revert to be the same as AFL Fantasy after that. So you can adjust your starting squad all weekend as required and players will lock as the games start. For those who play Supercoach, you have a full rolling lockout all weekend every weekend, so this week you can make as many changes to your side as you like until the start of the final game of the round between the Eagles and Swans. Regular DTTalk readers should know all about the Captain Loophole which only presents itself when you have a partial lockout, like we do tonight. For those new to the game here is the brief rundown on what it is. To enact the loophole, you pick a VC from tonight’s game between Carlton and Richmond. They are the only players that will be locked. If you like their score then you need to put a non-playing player on the field and make them your captain. At the same time you MUST put an Emergency in that line that would normally be on your field. What this does is it means that you now won’t have any cover for any late outs unless you put two emergencies on that line. If you don’t like the VC score, then just play on as normal and select a regular C for the game. Just beware, if you do decide to select two emergencies when you use the loophole, it is the LOWEST score of the two emergencies that will count! We get a lot of questions about this, but that is the way that it works. Is this the first thing you have read for the pre-season? Well I am flattered if that is the case, but really there is a heap of information you need to check out before you finalise your team. Here are the few of the things you should be looking at. Do you need to worry about the Bye period? Well when they first started we all poured over our starting line ups to make sure our structure was perfect. However, these days there are a lot more variables. For a start, there is now the “early bye” between Port and Gold Coast that throws a spanner in the works. This often stops people from selecting players from those teams, but if it is a rookie that you are going to upgrade/downgrade before round 10 then it isn’t a problem to pick them up. But the rest of the byes are in rounds 12-14 so you are likely to do a lot of your upgrading before we get to that point, this is where I start to really look at my bye structure more closely. If you do want to structure yourself for the byes what you want is to have more players missing later in the bye period than at the start. By doing this you can then trade your way through the byes by trading out those guys with a R14 bye after round 12 and trading in someone that has just had their bye in the preceding round. Complicated I know, but we will go into this in far more detail when we get that far. So where does that leave us? Well it is entirely up to you what you do. With your starting squad just keep an eye on the byes but remember that you will be making quite a lot of changes before we get to that point so don’t obsess over it. You won’t nail every rookie selection, we never do, so don’t panic when they don’t fire. If you don’t fully understand the Loophole, don’t use it. Also you don’t really want anyone in your team this week that isn’t playing (maybe R2 in AFL Fantasy). It’s only the first round, a poor score this week doesn’t rule you out from the overall prize. Get your leagues full before lockout if you can. In AFL Fantasy you can see the countdown timers on when your leagues start, in RDT and SC your league needs to be full by Friday Lockout as I have been reliably informed that the leagues will be set and merged if they aren’t full on Saturday night. Speaking of Leagues, I have put a few codes below for myself and one for another of our writers TriggyWiggy. Jump on in and take us on! But please only enter one of them so that there is plenty of room for other people to join in. 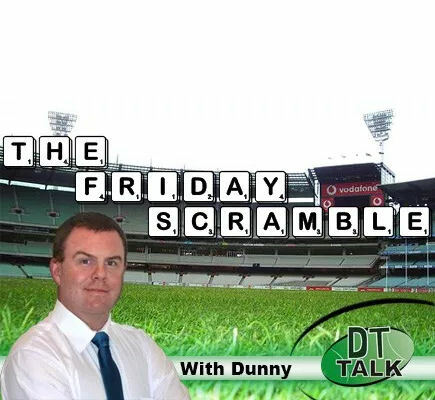 AFL Fantasy – Friday Scramblers league V5KLZKEH. If you do have a league you need to fill then put it in the comments below and I am sure it will get filled up pretty quickly. Good luck in the first round this year, remember it is a long season so don’t look for the Delete My Team button just yet if things don’t go your way. I will see you all back again next week on a Thursday once again as we have another Thursday night game in round 2. Half time: Glad at the moment that I decided against Nank. But Simpson is going well for me. Dow is firing up… switched him in for Kelly. Hoping for a 50! Simpson killing it! Just saw a truck driving through South Kensington with a big label “Rayner” on the back. Sign? A big hello from London dreamers. Simpson loving these kicks out of fullback!!! Does L Murphy = Relton Roberts?? Where is the Late mail info on the AFL website this year?